You think you know what you are feeding your dog, but how much do you really know about the ingredients used in that food? Similar to processed foods for humans, many dog foods contain dozens of different ingredients and it isn’t always easy to tell exactly what they are. When you pick up a package of dog food, it is easy to be distracted by pretty pictures and lofty health claims, but the important information is easy to miss. If you really want to do what is best for your dog, you should learn about his basic nutritional needs and take the time to figure out how to read a pet food label. Learning to read a pet food label is not something that comes overnight – it is a skill that takes practice and time to develop. If you simply want to know whether the food your dog is eating is good or bad, however, you can start by learning about some of the worst dog food ingredients that you should avoid in your dog’s food. You will find a list of the top 10 worst dog food ingredients list below as well as tips for choosing a high-quality pet food product. If you spoke to five different veterinarians or animal nutritionists, you would get five different answers in regard to the dog food ingredients that are most important to avoid. This speaks to a major problem within the pet food industry – that there are so many low-quality ingredients used by pet food manufacturers, that they can’t all be included in one list. But why exactly do pet food manufacturers use low-quality ingredients in their products? The main reason is money – the lower the quality of an ingredient, the lower the price. That means that the manufacturer can cut their own costs for production while still charging pet owners like you the same price. Corn – There is a great deal of debate regarding the value of corn as an ingredient in dog food. Some say that it is a valuable source of digestible fiber and protein, but others say that it little more than a filler ingredient and a common allergen. We believe that corn doesn’t have a place in high-quality dog foods, especially if it is used as one of the main ingredients. Wheat – Wheat products, particularly whole-grain wheat, are considered healthy and nutritionally valuable for humans but not for dogs. While some whole grains can be good sources of digestible carbohydrate and dietary fiber for dogs, wheat contains a protein called gluten that can cause serious allergic reactions in dogs. Wheat is also much more difficult for dogs to digest than other grains like brown rice or oatmeal. Soy – Soy is one of the top most common food allergens for dogs but many pet food manufacturers use it in their products because it is an inexpensive source of protein. Not only can soy trigger food allergies in dogs, but it also contains chemicals called phytoestrogens that mimic the effects of the hormone estrogen which can cause a variety of health problems in dogs. Soy also contains goitrogens, substances that may inhibit proper thyroid function. Fillers – As a general rule, you should avoid any dog food that uses a lot of ingredients which do not provide significant nutritional value – this is the case with fillers. Common fillers used in pet foods include things like rice bran, corn bran, soybean hulls, wheat mill run, modified cornstarch, oat hulls, and the like. These ingredients provide very little in the way of nutrients but they add bulk to the product which is why they are so valuable to pet food manufacturers – they can make more of their product at a lower price point. By-Products – The word “by-product” on a pet food ingredients list should immediately send up a red flag. While not all by-products are inherently dangerous, the quality of different by-products varies significantly so you can never really tell what you are getting. Animal by-products (like chicken by-product meal or poultry by-products) usually consist of the leftovers after the parts of a slaughtered animal that are fit for human consumption are removed. This may include things like feet, undeveloped eggs, bones, and organs (excluding giblets like liver, hearts, and necks). Plant Proteins – Dogs are carnivorous by nature which means that their bodies are biologically adapted to deriving nutrition more efficiently from animal products than plant products. Plant proteins like pea protein, potato protein, and the natural protein content of beans and legumes are not necessarily bad for your dog, but they are less biologically valuable than animal proteins. You also have to consider that many low-quality pet food manufacturers use plant proteins in their products to increase the protein content without adding more expensive meat. Coloring Agents – There is simply no good reason to include coloring agents in dog food – the only purpose is to make the product look more appealing to humans. Coloring agents you may see in low-quality dog foods include dyes like Red 40, Blue 2, and Yellow 5 as well as titanium dioxide, a white powder often used as a dough conditioner. Artificial Flavors – In the same way that you won’t find artificial colors in high-quality dog foods, neither will you find artificial flavors. Flavoring agents are only necessary when a product is not palatable enough on its own – many low-quality dog foods rely on artificial flavors to make the product more appealing to dogs. Artificial flavors may include things like animal digest, glandular meal, and anything that precedes the word “flavor”, except for natural flavors. Artificial Preservatives – Preservatives in dog food are used to extend the shelf-life of a product so that products can last longer before being sold and so they won’t go bad immediately after the bag is opened. Unfortunately, most of the preservatives used in low-quality pet foods are artificial and made from potentially dangerous chemicals. For example, BHA and BHT are known to have a carcinogenic effect on animals and have also been linked to organ damage. Ethoxyquin is another artificial preservative and it has been made illegal for use in human food but continues to be used in pet food. Sweeteners – Similar to artificial flavors, sweeteners play no nutritional role in dog food – they are simply used to make a product more palatable and appealing to dogs. Some common sweeteners used in dog foods include corn syrup, fructose, and sugar. These ingredients can add unnecessary calories (thereby increasing a dog’s risk for obesity) and may also increase the risk for dental problems. Again, these are just a few of the many low-quality ingredients that sub-par pet food manufacturers try to sneak into their products. For the most part, if an ingredient sounds like a chemical (like propylene glycol) or has a number in it (like Red 40), it probably isn’t good for your dog. The exception to this rule, of course, is for synthetic vitamin and mineral supplements which can sometimes have strange names. Just remember that the ingredients at the top of the list are used in the highest volume, so those ingredients should all be of high quality and sound nutritional value for your dog. Does this mean that you shouldn’t buy a dog food that contains one of these ingredients? Not necessarily. If your dog has an allergy or a sensitivity to one of these ingredients, by all means you should avoid it. But if he doesn’t, there may not be any reason for you to buy a limited ingredient diet or a dog food made with an expensive protein source. Before you go out and buy a new diet for your dog, take a little time to confirm that he does, in fact, have a food allergy and that his problems are not being caused by something unrelated. What many dog owners do not realize is that food allergies often present with different symptoms in dogs than they do in humans. If your dog eats something he is allergic to, it may not cause an immediate gastrointestinal symptom. The most common symptoms of food allergies in dogs are skin-related. If your dog has dry, itchy, inflamed skin or recurrent ear infections, it could be a sign of a food allergy or intolerance. You should talk to your vet to have other potential causes ruled out and then put your dog on an elimination diet until all traces of the allergy have disappeared. At that point, you can keep your dog on that diet or reintroduce potential allergens until you identify the culprit and then avoid it from then on. 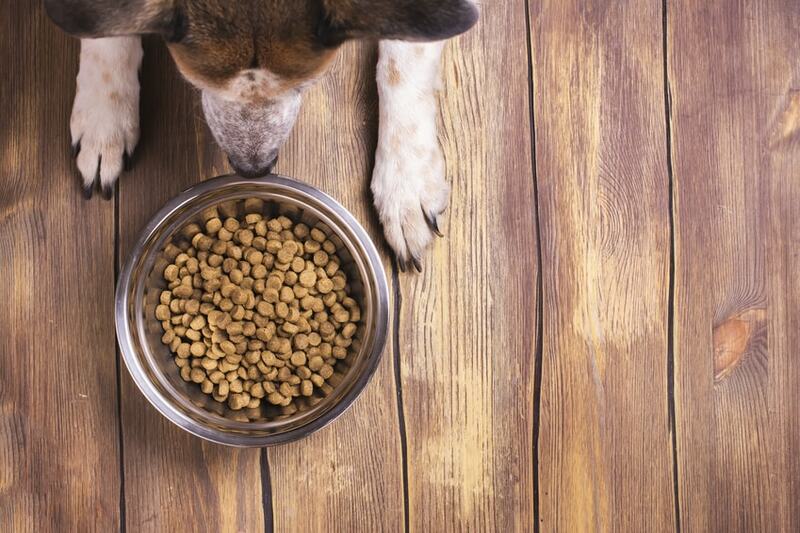 What Are the Best Dog Food Ingredients? A good rule of thumb to follow when it comes to the ingredients in your dog’s food is that if you don’t know what it is, it probably isn’t good for him. If the ingredients list starts with something you haven’t heard of or if you have any reason to question whether it is a high-quality ingredient, you are better off choosing something else. An easier way to look at it is, if a high-quality source of animal protein isn’t at the top of the list, don’t buy it. Dogs need a lot of protein in their diet because they are primarily carnivorous animals – their bodies simply aren’t biologically adapted to digesting plant foods. Unless your dog has a specific allergy, any kind of animal protein like meat, poultry, or fish makes for an excellent first ingredient. And don’t worry if the protein name is followed by the word “meal” – this simply means that the fresh meat has been cooked to remove moisture and it means that the ingredient is a very highly-concentrated source of protein. In addition to plenty of high-quality proteins, healthy animal-based fats are also valuable additions to a high-quality dog food. Fat provides your dog with a concentrated source of energy as well as omega fatty acids for skin and coat health. Just like proteins, most of the fats in your dog’s diet should come from animal sources – that includes things like salmon oil and chicken fat as well as fish proteins like fresh tuna or menhaden fish meal. Digestible carbohydrates like whole grains are quality ingredients for most dogs, unless your dog is allergic or sensitive to grains. In that case, look for starchy vegetables like white potatoes or sweet potatoes and other gluten-free, grain-free options like beans and legumes. It is also good to see beneficial additives included – things like chelated minerals, prebiotic fibers, and dried fermentation products for probiotic support. Your dog can’t go to the pet store and pick out his own food, so it is up to you to make a smart and healthy choice on his behalf. The diet you choose for your dog will have a significant impact on his total health and wellness, so it is not a decision that should be taken lightly. When shopping for dog food, make sure to avoid the two ingredients listed above and look for a product that includes some of the best dog food ingredients listed. As long as you do your best to choose a product that will meet your dog’s nutritional needs in a healthy way, you should be good to go. I pate my chicken and was wondering if I can add cooked white rice and what kind of vegetable can be added to that. I have a small female yorky with digestive issues.